Running from meeting to meeting, checking off the to-do list – that isn’t really living. Discovering the playful side of life. Spreading joy. Being colorful … clever … creative. And that is precisely what Be Brave. 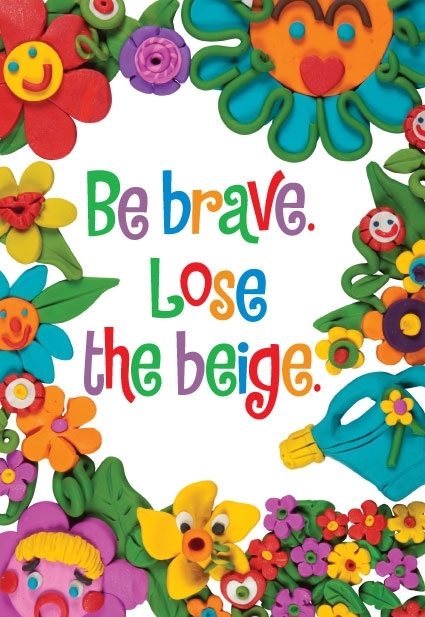 Lose the Beige is about – encouraging Lady Boomers (and anyone else who might listen) to discover their own colorful spirits. Be Brave. Lose the Beige gently pokes fun at societal rules and norms. It says yes when the world around us says no. Losing the beige is not just about color (although we are crazy about colors..all colors, the more the better) Be Brave, lose the Beige is really a life choice. It’s about exploring the playful side of life by escaping your incessant to-do lists, and experiencing more joy and fun. Bravery may be required as you assert the need for time to engage in pursuits of your own choosing. Color and joy will begin seeping back into a life turned beige by all the obligations and responsibilities we face on a daily basis.